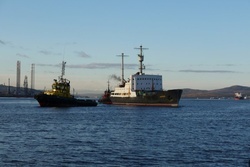 The Lepse nuclear service ship, which has since 1988 languished at dockside in Murmansk’s atomic icebreaker port, posing enormous radiological risks to the most populous city above the Arctic circle, was finally towed away for dismantlement this morning. The ridding of the ship from the harbor of Murmansk, a city of 305,000 people, represents the culmination of a monumental environmental achievement for which Bellona and its Russian and European partners have fought for 20 years. Gone from the Atomflot icebreaker port some 4 kilometers north of the center of Murmansk are 639 spent nuclear fuel assemblies stored in casks and caissons in the Lepse’s irradiated holds. A significant portion of these spent nuclear fuel assemblies were damaged during refueling operations of the nuclear icebreaker Lenin, making their extraction for storage impossible by conventional means. Bellona made its first trip to Murmansk’s Atomflot in 1992 and uncovered for the West the dangers of the Lepse and began studying ways to dispose of it. At the time, the only options seemed to be burying it on Novaya Zemlya, the former Soviet nuclear weapons test archipelago in the Arctic Ocean. But the two decade have brought about technological advances that will, it is hoped, allow for safe dismantlement of the Lepse, said Hauge. 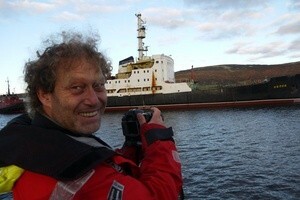 According to Andrei Zolotkov, director of Bellona Murmansk, today’s events are of enormous symbolic significance. Now under tow away from Murmansk, the Lepse will be delivered to the Nerpa Shipyard – a nuclear naval shipyard further north on Kola Bay – for dismantlement on land at a specially constructed dry dock. There the vessel will literally be sawed into thirds, removing the bow and stern and leaving the middle section where the bulk of the spend nuclear fuel lies, said Alexander Nikitin, a former Russian submarine captain and chairman of the Environmental Rights Center (ERC) Bellona in St. Petersburg. What can be removed safely will be packaged and sent to the Mayak Chemical Combine in the Southern Urals. Damaged and broken fuel assemblies, many of which were hammered into their storage caissons, will have to be extracted by methods largely invented on the spot. If necessary, said Nikitin, this damaged spent fuel could, by special agreement, be stored at Sayda Bay, which traditionally houses irradiated reactor compartments – a very different sort of radioactive waste. The Lepse’s bow section is also anticipated to contain irradiated icebreaker technical equipment and machinery. The overall price tag for dismantling the Lepse is expected to weigh in at more than 30 million euro, financed largely through European countries via the European Bank of Reconstruction and Development (EBRD). Of equal importance to getting shut of the tremendous nuclear hazard in the middle of Murmansk is guarding the safety of the workers who have both maintained the Lepse and those who will be dismantling it. Nikitin said that in 1992, it was anticipated that some 5000 workers would be defenseless against the annual radiation levels they would be exposed to during it’s the ship’s dismantlement. In order to save these workers, many plans therefore aimed at simply dumping the Lepse near Novaya Zemlya. Nikitin cited an incident in Northwest projects where safeguards for workers were poorly observed, resulting in he irradiation of several naval conscripts. Spent nuclear fuel assemblies had dropped to the bottom of their storage tanks because the rusty chains supporting them broke. The situation became critical, threatening to set off an uncontrolled chain reaction. The conscripts were forced to collect the spent fuel assemblies with their bare hands, getting their annual radiation dose in one day. But Nikitin pointed to the advent of robotic technologies that will be used to deal with spent nuclear fuel rods on the Lepse. “We had to wait 20 years to begin dealing with the problem of dismantling the Lepse – the technological advances made during that time are the upside of such a long wait,” said Nikitin. The keel for the Lepse, a dry goods ship, was initially laid in 1934 and construction on it continued until World War II. It was eventually dumped in a river in the Ukraine. Its reactivation came about when the icebreaker Lenin was under construction and the Lepse’s durable hull saved it from mothballs. In 1961, it was specially retrofitted to refuel the Lenin and the growing icebreaker fleet at sea, pulling spend nuclear fuel off, and refilling icebreakers’ reactors. Between 1963 and 1981, the Lepse re-loaded nuclear fuel on the nuclear powered icebreakers Lenin, Arktika and Sibir 14 times. In 1981, it was again retrofitted to become a storage ship for irradiated parts and waste as well as spent nuclear fuel assemblies. The Lepse also participated in dumping radioactive waste in the Kara and Barents Seas, which has left a Cold War legacy of nuclear and radiological hazards strewn across the sea floor, the extent of which is only beginning to be understood. Bellona’s Hauge said that if the Russian side is willing to adhere to transparent principles and continue cooperation with non government organizations, many of these problems can be effectively dealt with.